Google Now is great for getting directions, checking the weather, looking up the definition of a word, or just searching the Web, but that’s no longer all it can do. With the help of a free app called Commandr for Google Now, you can toggle Wi-Fi on or off, pause your music, or ask your phone to read your text messages out loud, all by speaking a few simple voice commands. Commandr plugs into Google Now’s voice assistant to let you control your phone by speaking to it, and it’s particularly helpful for when you can’t use your screen, like when you’re driving. 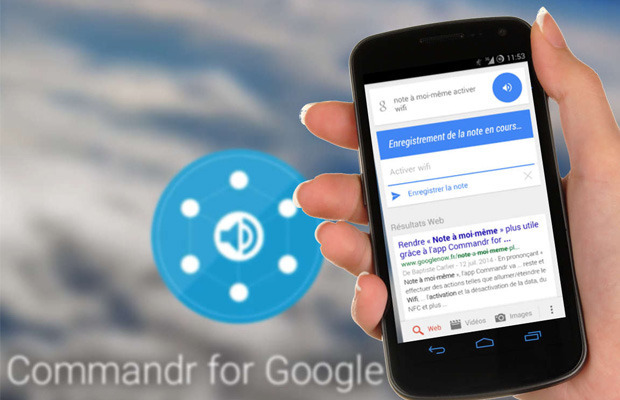 It works by reading the text that Google transcribes when you speak in Google Now’s voice search. 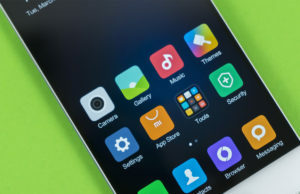 The app debuted at the beginning of July, but was slightly limited at the get-go. After you launched Google Now, you had to say “note to self” first, then the command you wanted. Just a few weeks after launching, an update changed that, and now you can simply state your desired command, such as “GPS on” or “raise volume.” Here’s how to get started, and a few ways you can use it. After you’ve downloaded and installed Commandr, go through the app’s short setup process. You get two choices here: you can either give the app accessibility access on your phone so it can listen your commands, or you can use a limited version of Commandr that requires you to say “note to self” before each command. If you choose the former, Commandr walks you through a short setup process to activate the accessibility service on your phone in the settings menu. Just so you know, accessibility services are often used for apps or with built-in features designed for those with visual or hearing impairments. With each command, the app tells you the exact phrase you say to execute it — they aren’t difficult to remember, but it’s helpful to know the magic words. You can customize the phrase as well, to fit whatever makes sense for you. 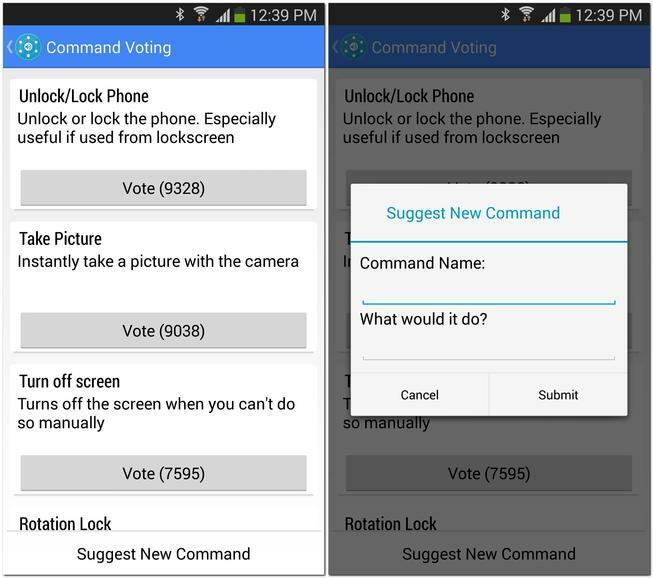 Commandr’s developer, Ryan Senanayake, is working on adding new commands to the app, and you can help by voting for suggestions that other users have submitted to show which commands are most popular. 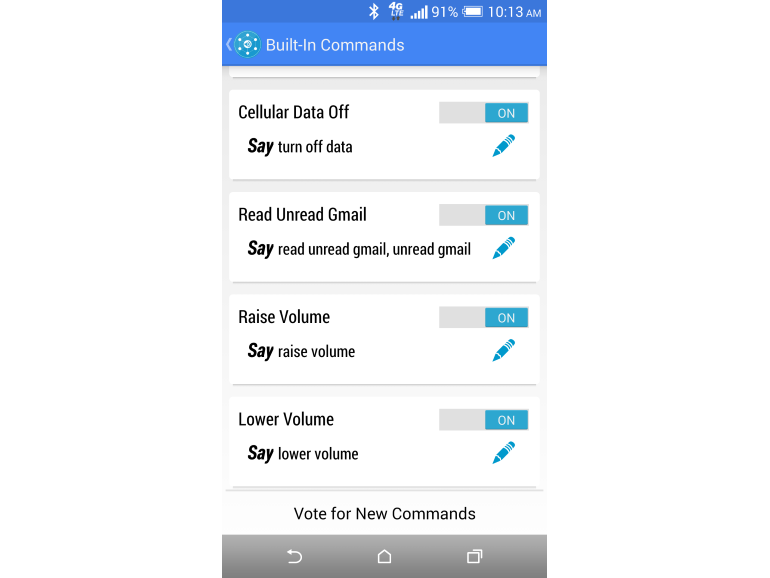 You can view and vote for the latest contenders by tapping “Vote for New Commands” at the bottom of the Built-in Commands page. If there’s a command you’d like added that’s not already on that list, just tap the “Suggest a New Command” button to submit it. 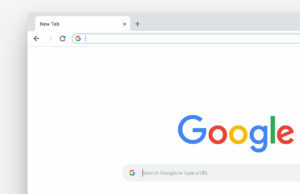 Now that you’ve picked the commands you want to use with Commandr, the next time you want your phone to carry out that action, launch Google Now the way you normally would, either by swiping up from the bottom of your screen or saying “OK Google” while on your home screen. When the Google Now dashboard appears, say “OK Google” to launch voice search and then speak your command. 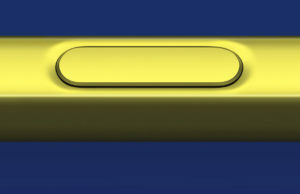 Your phone should then do what you ask, whether that’s turning on your flashlight or pausing your music. That’s all there is to it.